Gripknife is a revolutionary foregrip with one major advantage—it can save your life. That simple. With the push of a button, your grip instantly becomes your knife. In close-quarters, should an enemy try to come in-between you and your rifle, you’ll have the option to surprise them by transitioning from your primary weapon, to employing an edged weapon, all in the blink of an eye—nothing is quicker. No OTF knife is stronger. Nothing more effective. Period. Made in the heart of America. "The Knife is a great morale builder. A man, without one, especially in the dark, is on the defensive, but, put a knife in his hand and it's a different story. He is aggressive, confident, he has psychological support." "This wonderful world of firearms accessories never ceases to amaze with its deadly ingenuity, and the Gripknife is no exception." "It's easy really: the name says it all. It's a grip, and a Knife. Its a Gripknife." "Gripknife is looking to update the bayonet with radical new design." 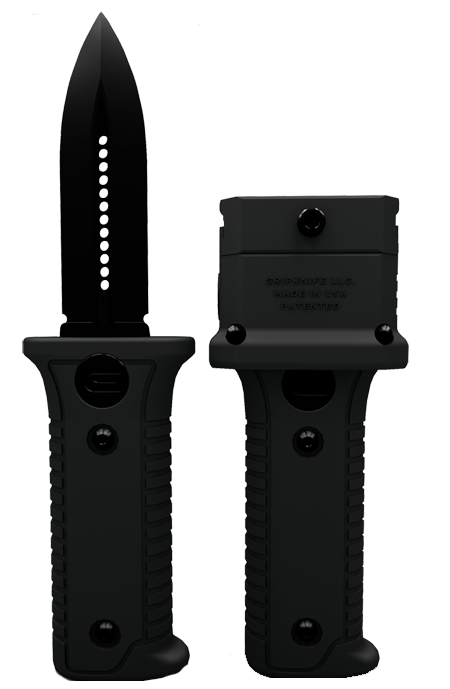 "This ground-breaking product bring the badass back to bayonets. Combining a tactical knife with a vertical grip for a firearm, the knife is ideal for military-style carbines in close quarter."